As a business leader, it’s no longer enough to simply be good at your day job. Employees need and expect more and more from their c-suite and senior team. We recently held a roundtable with some of the best and brightest minds in internal communications – with panellists including broadcaster Guto Harri, CEO and founder of fintech start-up Aire Aneesh Varma, Cyrus Akrami from Workplace by Facebook and George Gordon, who until recently was the Corporate Communications and Campaigns Director at Tesco. There has never been so much pressure on those at the top of business. Research we conducted earlier this year confirms this, showing that internal communications and employee engagement is firmly on the c-suite agenda. We worked together with Censuswide to interview 125 members of c-suite across multiple sectors, up and down the UK. 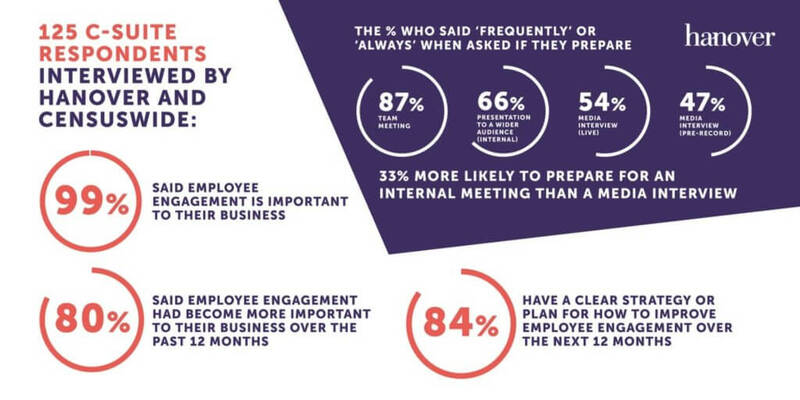 Virtually all (99%) respondents said internal communications was important to their business – and 80% said that employee engagement has become more important over the past 12 months. A job is no longer “just a job”. Employees don’t simply check in and check out. They have an emotional connection to the brand that they work for and their drive, motivation and productivity is driven by how they feel about the business. They want a leadership team they understand and respect; humans, who don’t speak in jargon or overly corporate language, who can motivate, inspire and convey empathy when they need to. But employees asking for so much places a huge emotional burden on those at the top. One of the roundtable attendees commented that it’s easy to get buy-in on the importance of communication at c-suite level but too often, this is followed by an assumption that any message delivered by c-suite automatically trickles down to the most junior members of the business. This is not the case. And from what we’ve seen and heard from some of our clients this is a common problem. To add further weight onto c-suite shoulders, our research findings showed that despite businesses becoming more and more digital, face-to-face is still the most important and effective medium for communicating within an organisation. But how can c-suite engage their employees without clearing their diary and going to speak to each team and each office on a regular basis? The answer is simple. Empower those in the middle. Having middle managers that are good communicators makes the cascading of messages much easier, as they can pull out the parts of a c-suite communication that are relevant and relay these to their team in a way that will resonate best with them. Managers who are engaged are also more likely to feel a strong tie to both those that they manage and the business itself. We have trained the middle and people managers for a number of our clients and have heard how much of a difference the training has made to both engagement levels and morale within the businesses. In some cases, where the managers have really taken the training to heart, they have created a ‘pivot point’ for communication – so messages and information not only travel more easily both from top to bottom but also from bottom to top. If your c-suite is feeling under pressure or you think messages are getting lost somewhere in the system, the solution could be inside your business. For further data or information please contact Sinead Meckin, Internal Communications Lead.